From the 'family camp' on top of Canaan Mountain in Nova Scotia, just north of the Bay of Fundy and for miles along the mountain slope, are some of our colorful fields, a verdant green and blue during the summer, just prior to harvest and a bright sea of orange and red during the fall. 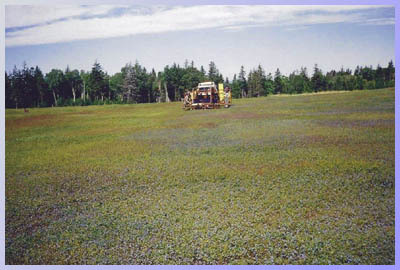 At the core of the business are substantial blueberry land holdings spread almost equally between Nova Scotia and New Brunswick that have generated a livelihood for the Collins family for more than three generations. The family has demonstrated its know-how of the wild blueberry growing and harvesting business by designing and building some of its own equipment, exceeding industry standards for yields and efficiency during harvest time. 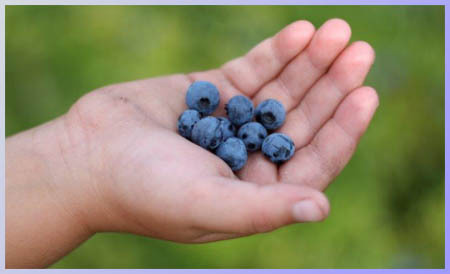 For nearly a decade, prior to acquiring and building it's own IQF processing facility in Franklin, Maine, the family was a minority stakeholder in a blueberry processing plant in Quebec. George E. Collins, today's family patriarch and visionary, inherited the growing business from his parents and along with brothers Corlas and Merlin, developed it into one of the largest independent wild blueberry growing operations in Atlantic Canada; in later years, he acquired the interests of brother Merlin and takes care of the annual disposition of Corlas's crop; from several hundred thousands pound annually, farming operations have grown to several million lbs. today with more fertile blueberry land coming on stream every year. John Collins, his eldest son has spearheaded the move from only growing fresh berries into securing higher value from IQF freezing in a company owned facility in Franklin, Maine acquired during the spring of 2013. As CEO of the new operation, Franklin Processing Inc., John's operational and technical skill set, combined with his business leadership, has overseen the commissioning and start-up of the processing operation during the summer of 2014. Chris Collins manages internal financial controls, supplier relations and general administration for the group; finally, Mike and Cory Collins bring technical and operational skills to the running of the business. Since late 2010, 'elder statesman' Michael H. Condé of Nova Business Ventures, a business advisory service, has provided valuable assistance in the development of formal business and marketing plans, financial planning and control, relations with external private and public sector collaborators, market and scientific research and in-market business development. His background includes several decades in senior food processing and international marketing and business development management. Over the years, our methods of growing and harvesting berries has undergone dramatic changes. We have invested in equipment and practices that are much quicker and efficient but we still put great care into providing our customers with the best blueberry product available.